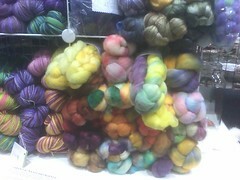 Stitches west proved to be overwhelming as always. Helping out in booths was a great way to prevent me from doing too much shopping. And it allowed me to surround myself with lovely Pigeonroof goodies on Friday, and all kinds of crafty goodies at Urban Fauna on Saturday. I did a miniature loom demo in an area that was not conducive to the audience seeing a tiny loom (and the chairs were bolted together so they couldn’t scooch in). 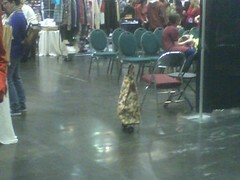 But I think several people were able to ask questions and take a closer look. Several of them ended up getting looms, so I was able to get the work out that tiny looms are rad! I peeked in on my fiber at the UFS booth, trying its hardest to jump into the hands of passing customers. While I was helping at the UFS booth, I tried needle felting. 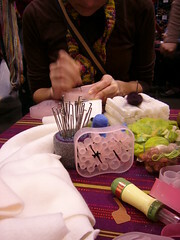 Jamie always has a little needle felting demo area set up, and usually I resist. I am not that into making things tangled, but she had these neat-o cookie cutter like forms so you could make shapes (see the center of the photo below), so I gave in. It was pretty fun! Much funner than anticipated. I am blown away at what a small amount of fiber it takes to embellish something with felt. Spinners, save your scraps and you could make a felter have a stash that will set them for life. I am also impressed that Jamie’s needle felting kits include everything you need to get started – fiber, needles, and a natural foam pad. So what did I buy? I already knew that I wanted a Tiger Cascade spindle from Carolina Homespun, so I made that purchase as soon as I arrived. On Friday, I got some CPH buttons from “Buttons!” (*jazz hands*). 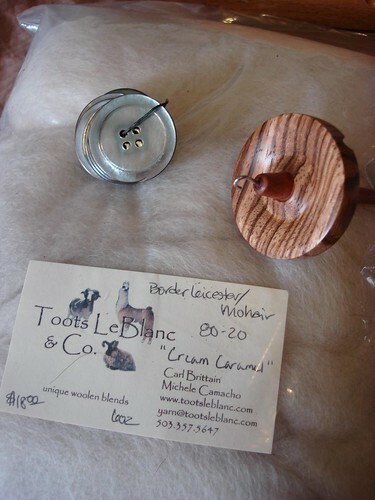 On Saturday I got two bags (6oz each) of Border Leicester/mohair from Toots LeBlanc. That’s it! Major restraint! One Response to "Stitches West is overload"
I still haven\’t made it to Stitches West. One of this days!